Dr Bottorff is Professor in the School of Nursing and Director of the Institute for Healthy Living and Chronic Disease Prevention at the University of British Columbia in Vancouver and Professorial Fellow in the Faculty of Health Sciences at Australian Catholic University in Melbourne. Dr Seaton is Research Coordinator in the Institute for Healthy Living and Chronic Disease Prevention. Ms Lamont is Provincial Director of Prevention Programs for the BC Cancer Agency in Vancouver. 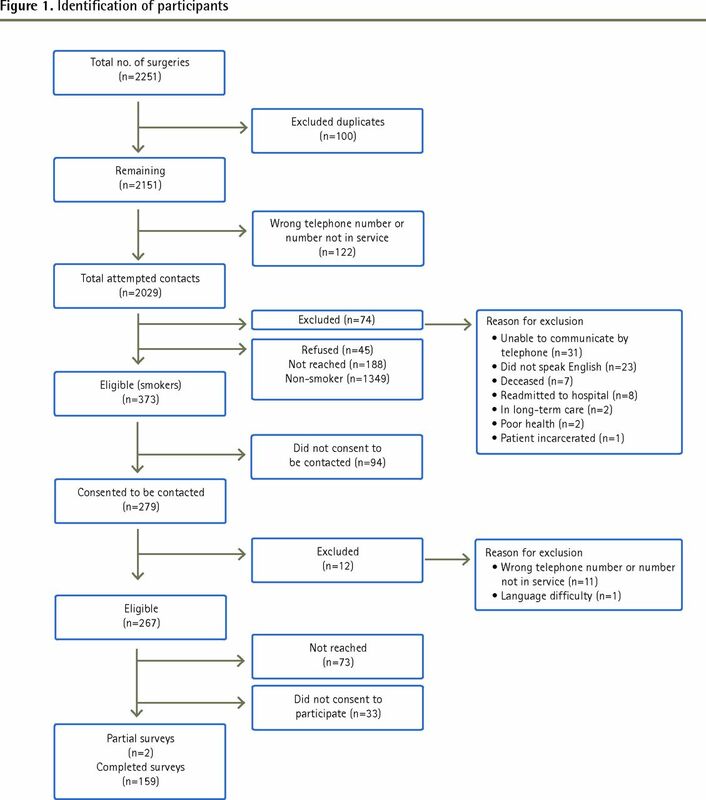 Objective To describe the smoking patterns of patients receiving elective surgery and their knowledge about the benefits of smoking cessation to inform and strengthen support for patients to quit smoking in order to optimize surgical outcomes. Design Patients who had elective surgery were screened for smoking status, and eligible patients completed a telephone survey. Setting Two regional hospitals in northern British Columbia. Participants Of 1722 patients screened, 373 reported smoking before surgery. Of these, 161 (59.0% women) completed a telephone survey. Main outcome measures Patient smoking cessation, knowledge of the perioperative risks of smoking, use of resources, and health care provider advice and assistance. Results Participants included 66 men and 95 women (mean [SD] age of 51.9 [14.0] years). In total, 7.5% of these patients quit smoking in the 8 weeks before their surgeries, although an additional 38.8% reduced their smoking. Only about half of the patients surveyed were aware that continuing to smoke increased their surgical risks. Further, only half of the patients surveyed reported being advised to quit before their surgeries by a health care professional. Few were using the provincial resources available to support smoking cessation (eg, QuitNow), and 39.6% were unaware of the provincial program to cover the cost of smoking cessation aids (eg, nicotine gum or patches), yet 62.7% of respondents were thinking about quitting smoking. Conclusion Many surgical patients in northern British Columbia who smoked were unaware of the perioperative risks of smoking and the cessation support available to them. An opportunity exists for all health care professionals to encourage more patients to quit in order to optimize their surgical outcomes. The challenges inherent in meeting the need for surgical services in northern and rural regions of Canada have been addressed through various practice models involving resident specialist surgeons and general practitioner surgeons, as well as family physicians and other health professionals.1 Accordingly, in low-volume centres, ensuring the quality and convenience of care for patients before and after surgery is a responsibility that is shared by a range of health care providers, including family physicians in remote communities served by these centres, where surgical patients might reside. In Canada, nearly half of all smokers report that they attempted to quit in the past year, and two-thirds were planning to quit within the next 6 months.10 The smoking rate in northern British Columbia (BC) in 2012 was 24%, substantially higher than the provincial average of 11%.10,11 The region also has the highest rate of lung cancer in the province. Consequently, implementing new approaches to support smoking cessation is a priority for strengthening cancer prevention in northern BC. Although patients who smoke benefit from smoking cessation support before surgery,12 up-to-date information is lacking from northern and rural regions about smoking cessation rates among surgical patients and the information and support they receive for cessation. This information is needed to guide future efforts to enhance health care services in these regions. The objectives of this study were to survey a sample of northern BC surgical patients who smoked in order to investigate their level of knowledge about the perioperative risks of smoking, the proportion of patients who quit smoking before surgery, whether health care provider advice was received, and patients’ knowledge and use of resources to support smoking cessation. This research was approved by the University of British Columbia Behavioural Research Ethics Board and the Northern Health Research Review Committee. This cross-sectional study involved surveying surgical patients recruited from 2 regional hospitals serving northern BC residents. One hospital, a 200-bed facility near the centre of BC, carries out approximately 5700 surgeries annually. The second, a 25-bed facility located in the northwest that performs approximately 1600 surgeries annually, was chosen to represent other northern regional hospitals offering a full range of services. A provincewide effort and a tobacco reduction policy in the health authority were in place to encourage health care providers to advise and assist with cessation. To recruit participants, patients (n = 2251) who underwent elective surgery at the 2 hospitals between December 1, 2012, and March 31, 2013, were contacted and screened. Of the 1722 patients contacted, 373 (21.7%) reported smoking at least 1 cigarette in the 6 months before their surgeries. Of these, 279 patients provided consent to have their contact information released and were forwarded a letter about the study before receiving a telephone call inviting them to participate in a telephone survey. Figure 1 outlines participant inclusion and exclusion. Patients who participated in the telephone survey were mailed a $5 gift card. Items assessing tobacco use were derived from measures used in national surveys and developed by experts in the field. The survey was pilot-tested with a subsample of participants (n = 10). Patients were asked about their smoking before and after their surgery (eg, Did you smoke cigarettes in any amount in the 2 months before your surgery? In the 2 months before your surgery, how many days in total did you not smoke any cigarettes [not even a puff]? During the 2-month period before your surgery, did you reduce your smoking?). Also included were questions about advice and support received from health providers (eg, Did your doctor or another health provider advise you to quit smoking at any time in the 2 months before your surgery? When you were in hospital for your surgery, did anyone ask you about your smoking?). Finally, patients were asked about any smoking cessation resources they used before surgery (eg, QuitNow) and whether they were aware of the BC Ministry of Health program to cover the cost of smoking cessation aids (eg, nicotine gum or patches). Two measures with established reliability and validity were also included to describe the patient sample: the smoking stages of change scale (short form) based on the transtheoretical model of behaviour change13 and the Fagerstrom Test for Nicotine Dependence14 (Cronbach α = .65). Finally, a measure developed by Webb and colleagues was included to assess awareness of smoking-related perioperative complications.6 Using a Likert response scale (very likely = 3; somewhat likely = 2; somewhat unlikely = 1; very unlikely = 0; do not know = 0), patients were asked, “As far as you know, does smoking make any of the following likely?” for each of slower healing of wounds after surgery, increased risk of infection after surgery, increased pain after surgery, increased complications with the anesthesia, and increased risk of future heart or lung problems. Responses to the first 4 items were averaged to create a scale for awareness of smoking-related perioperative complications, with scores ranging from 0 to 3 (Cronbach α = .75). The last item assessed future health problems related to smoking and was scored separately. Categorical variables were summarized using frequencies and percentages, and continuous variables were summarized using means and standard deviations. Data analyses were completed using SPSS, version 21.0. In total 161 patients (66 men, 95 women), ranging in age from 20 to 78 years, participated in the survey. This represents a response rate of 60.3% of eligible participants. Demographic and smoking-related characteristics are displayed in Tables 1 and 2, respectively. In total, 105 (65.6%) patients reported that they quit smoking for at least 24 hours in the 2 months before their surgery. Presurgical quit durations were predominately short (Table 3), yet 12 (7.5%) patients abstained from smoking for the entire 8 weeks before their surgery, and an additional 62 (38.8%) reported that they reduced their smoking. Independent-samples t tests and χ2 analyses revealed that the samples from the 2 hospitals did not differ on any demographic or smoking-related variables. Demographic characteristics of the patient sample: N = 161; not all participants answered all questions. Smoking-related characteristics of the patient sample: N = 161. Number of days in the 2 months before surgery on which patients did not smoke at all: N = 161. Although most patients correctly identified future heart and lung problems as a smoking-related risk, the mean (SD) score on the awareness of smoking-related perioperative complications scale was low (1.22 [0.83], range 0 to 3). Slightly more than half identified slower healing as being “very likely or somewhat likely”; however, less than half were aware of the association between smoking and postsurgical infection, pain after surgery, or complications with anesthesia (Figure 2). Patients who quit or reduced their smoking before surgery did not have a higher mean (SD) awareness score (1.20 [0.88]) than those who continued to smoke the same amount (1.23 [0.79]; F1,156 = 0.05, P = .83). , P = .84). Patients who were advised to quit also did not have a higher mean (SD) score on the awareness of smoking-related perioperative complications scale (1.23 [0.87]) than those not advised (1.22 [0.79]; F1,157 = 0.00, P = .98). In the 2 months before their surgery, 34 (21.3%) patients reported using nicotine patches, 24 (15.0%) used nicotine gum or lozenges, and 12 (7.5%) used a medication (eg, varenicline). QuitNow services were used infrequently: 8 (5.0%) reported accessing the website, 10 (6.3%) accessed the telephone service, and none reported using the text service. In total, 63 (39.6%) were unaware of the BC Ministry of Health program to cover the cost of pharmaceutical cessation aids, and 36 (22.4%) had received aids through this program. Smoking cessation before surgery provides an important opportunity to optimize surgical outcomes. To our knowledge this is the first study to provide information about patterns of smoking cessation before surgery in a health authority serving a large rural area where multiple hospitals of varying size provide surgical procedures. The findings indicate that in a sample of surgical patients in northern BC, knowledge about the perioperative risks of smoking and use of smoking cessation resources were low. Further, few patients were completely smoke free before their surgeries, even though stage of change scores suggested most were interested in quitting. There were no differences between the patients having surgery in the low- and high-volume regional hospitals. The fact that many patients were unaware of the association between smoking and postsurgical infection, slower healing, pain after surgery, or complications with anesthesia mirrors the findings of research conducted in Australia.6 Awareness of the association between smoking and heart and lung problems in this sample was similar to findings reported by Webb et al6 and might be attributable to public health campaigns and cigarette label warnings about these more general risks. The results suggest a need for systematic approaches to ensuring that all surgical patients who smoke are provided with information about the perioperative risks of smoking. The 2 northern BC hospitals included in this study are regional hospitals serving residents from many surrounding communities. Patients were therefore likely to be in contact with their family physicians as well as their surgeons both before and following their elective surgeries. In addition, all patients were required to attend a preoperative assessment within 30 days of their surgery, providing another opportunity for a health care professional to address tobacco use. Nevertheless in our study, only half of the patients surveyed reported being advised to quit in the 2 months before their surgery by a health care professional. These findings are similar to a 2012 national survey of Canadian smokers that found that only half of those who had visited a health care provider in the previous 6 months had been advised to quit.10 Yet a recent survey of patients from Ontario family health teams indicates a promising trend to higher rates, with 74% having been advised to quit smoking in the previous 12 months.15 Our findings suggest that in regional and northern centres where smoking rates are higher, there is an opportunity for improving targeted cessation advice and support. Physician advice and support has been shown in other research to increase patient smoking cessation,20 and experts agree that pending surgery can provide further incentive for patients to stop smoking.7,9 Given that most surgical patients were interested in quitting, and that presurgical services are provided by various health professionals, systems need to be designed to ensure that throughout the perioperative period all elective surgery patients are screened for smoking status and provided with information about the benefits of smoking cessation for surgery, assistance with quitting, and referral to cessation resources. As these health care professionals have numerous other roles and responsibilities, systems for addressing tobacco use with surgical patients in rural communities should be easy to use and flexible, and should enable information to be shared between community-based providers and hospital services. Family physicians have an important role in advocating for such systems and the resources to enable the provision of patient education and support for smoking cessation during the entire perioperative period. It should be noted that there are limits in terms of generalizability when describing the retrospective experiences of a regionally based sample of surgical patients. Participant responses might be subject to recall bias, and smoking patterns were based on self-report. In addition, we oriented our research to the 2 months before surgery. Although it is possible that some patients waiting for elective surgery might have received advice about smoking cessation before this time frame, the low rates of smoking cessation before surgery indicate that patients would benefit from additional support. The findings provide new information on patient smoking behaviour before surgery that can serve as a basis for measuring changes in policies and practice aimed at strengthening surgery-specific smoking cessation. The results of this research indicate that there continues to be gaps in patient knowledge of the surgical risks of smoking. An opportunity exists for all health care professionals serving rural and northern communities to optimize surgical outcomes by informing patients about the benefits of quitting smoking before surgery and the resources available to support smoking cessation. This research was supported by the Canadian Cancer Society Research Institute (Grant #701259-00). There is a substantive body of evidence linking smoking before surgery to increased perioperative risks. This survey of surgical patients from northern British Columbia who smoked revealed that many of them were unaware of the perioperative risks of smoking, only half were advised to quit smoking before their surgery, and few used provincial cessation resources. Increasing patient knowledge of the surgical risks of smoking and the availability of cessation resources might encourage more patients to quit before surgery and optimize surgical outcomes. De nombreuses données indiquent que le fait de fumer avant une opération augmente les risques péri-opératoires. Cette enquête chez des fumeurs du nord de la Colombie-Britannique en attente d’une chirurgie a révélé que plusieurs d’entre eux n’étaient pas conscients des risques péri-opératoires qu’ils encouraient en fumant; seulement la moitié avait eu le conseil de cesser de fumer avant l’opération et seuls quelques-uns avaient eu recours aux ressources provinciales favorisant l’arrêt du tabac. En renseignant davantage les patients sur les risques chirurgicaux associés au tabagisme et sur les ressources existantes pour arrêter de fumer, on pourrait aider plus de patients à cesser de fumer avant leur intervention et ainsi optimiser les résultats des chirurgies. Dr Bottorff was involved in the study conception and design, data collection and interpretation, and drafting, revising, and approving the article. Dr Seaton was involved in the study design, data collection and analysis, interpretation of the data, and drafting the article. Ms Lamont was involved in the study conception and design, and drafting the article.
. The experience of GP surgeons in western Canada: the influence of interprofessional relationships in training and practice. J Res Interprof Pract Educ 2013; 3 (1):43–61.
. Preoperative smoking status and postoperative complications: a systematic review and meta-analysis. 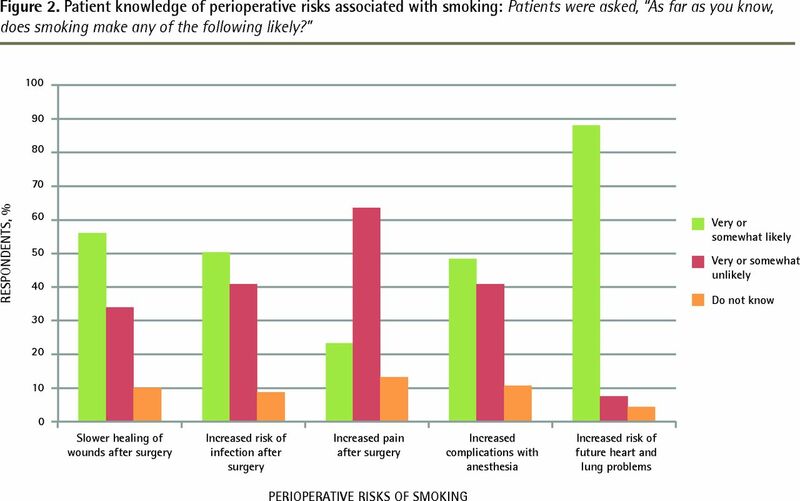 Ann Surg 2014; 259 (1):52–71.
. Impact of smoking on perioperative outcomes after major surgery. Am J Surg 2015; 210 (2):221–9. Epub 2015 Apr 23.
. Wound healing and infection in surgery. The clinical impact of smoking and smoking cessation: a systematic review and meta-analysis. Arch Surg 2012; 147 (4):373–83.
. Smoking and perioperative outcomes. Anesthesiology 2011; 114 (4):837–46.
. Smokers know little of their increased surgical risks and may quit on surgical advice. ANZ J Surg 2013; 83 (10):753–7. Epub 2013 Feb 17.
. Surgery as a teachable moment for smoking cessation. Anesthesiology 2010; 112 (1):102–7.
. Toronto, ON: Ontario’s Anesthesiologists; 2014. Available from: www.ontarioanesthesiologists.com/what-we-do. Accessed 2015 Jun 13.
. The role of anesthesiologists in promoting smoking cessation. Can J Anaesth 2011; 58 (10):897–9 (Eng), 899–901 (Fr). Epub 2011 Jun 30.
. Tobacco use in Canada: patterns and trends. 2014 ed. Waterloo, ON: Propel Centre for Population Health Impact, University of Waterloo; 2014. Position on tobacco reduction: an integrated population health report. Prince George, BC: Northern Health; 2012.
. Interventions in the preoperative clinic for long term smoking cessation: a quantitative systematic review. Can J Anaesth 2008; 55 (1):11–21.
. Distribution of smokers by stage in three representative samples. Prev Med 1995; 24 (4):401–11.
. The Fagerstrom Test for Nicotine Dependence: a revision of the Fagerstrom Tolerance Questionnaire. Br J Addict 1991; 86 (9):1119–27.
. Delivering evidence-based smoking cessation treatment in primary care practice. Experience of Ontario family health teams. Can Fam Physician 2014; 60 :e362–71. Available from: www.cfp.ca/content/60/7/e362.full.pdf+html. Accessed 2015 Nov 9.
. Pharmacotherapies for smoking cessation: a meta-analysis of randomized controlled trials. CMAJ 2008; 179(2): 135–44. Erratum in: CMAJ 2008; 179 (8):802.
. Update on pharmacologic and nonpharmacologic therapies for smoking cessation. Can Fam Physician 2008; 54 :994–9.
. Treating tobacco use and dependence: 2008 update. Clinical practice guideline. Rockville, MD: US Department of Health and Human Services, Public Health Service; 2008.
. Telephone counselling for smoking cessation. Cochrane Database Syst Rev 2013 ;(8):CD002850.
. Physician advice for smoking cessation. Cochrane Database Syst Rev 2013 ;(5):CD000165.